Colibrì is the ideal solution for medium/small hotels and workplaces and completes the Necta portfolio of breakfast solutions. The Colibrì is flexible and offers a choice of layouts, allowing the drinks menu to be configured to suit a wide range of requirements. Thanks to the Z 2000M brewer unit, Colibrì can make an excellent espresso coffee with a long lasting crème and fuller body, compared to a traditional coffee. In order to obtain drinks of a consistently high quality, starting from the first coffee, the unit is preset for the installation of a heater into the brewing chamber. 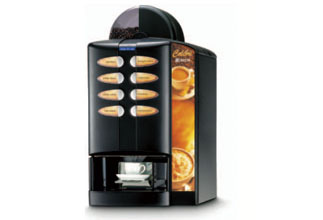 This ensures an optimum extraction temperature and improves the appearance of the drink. The Necta mixers produce instant drinks, using soluble products, which are of a consistently high standard. The dispensing cycles are designed to obtain the best possible results concerning drinks quality and output. Made very straightforward due to the modular functional components that can be accessed directly from the front of the machine and are easy to remove. The drip tray and the coffee grounds container are also simple to remove – even by non-qualified personnel. The new mixers have a built in powder suction drawer, which reduces the number of components, therefore, allowing them to be quickly removed for thorough cleaning.